Planning for your retirement isn’t about selecting an insurer based pension contract or a self administered pension contract. What it’s really about is anticipating the future value of your assets and liabilities, and then analysing whether the net income will be sufficient to meet your expenses in old age. In many cases we have helped our clients to consolidate multiple pension funds from previous employments allowing them to manage their retirement funds more effectively as well as ensuring that the most appropriate investment strategy is used. 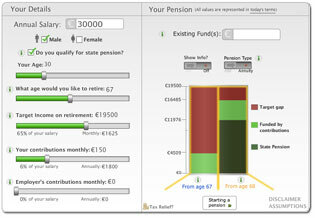 While we always advocate individual advice you can use our pension calculator below to see how much additional funding you may need to undertake from this point onwards.